Feel the chopping board and the frying pan, which feels colder? Now put an ice cube on the frying pan and one on the chopping board - Which one melts first? You should find that the frying pan feels colder than the chopping board, and so it may be a surprise that you should find that the ice cube on the frying pan melts much more quickly than on the chopping board! The two ice cubes melting speeded up by a factor of about 50. Melting ice takes a lot of energy and this energy needs to come from somewhere. Normally this energy is released by cooling down the ice cube's surroundings, which is why you can cool a drink by putting ice cubes into it. 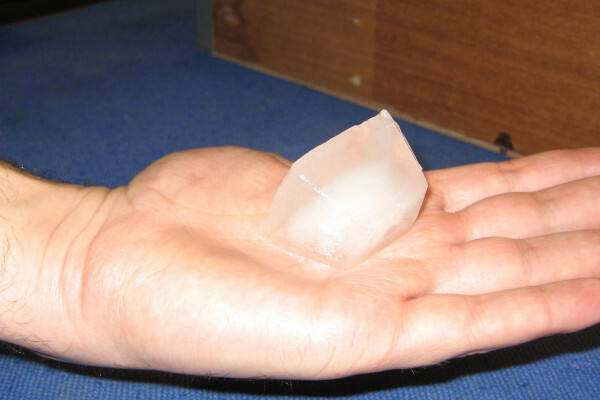 How fast the ice cube melts depends on how fast energy can be transferred from the surroundings into the cube. Materials like metals conduct heat very well, which means that because the cube is cooler than the saucepan, heat is moved from all over the saucepan into the cube, so the cube melts quickly. So why did the pan feel cold? As it's a good conductor, it also means that if you put your warm finger on the frying pan heat is conducted out of, and away from, your finger quickly. This makes the pan feel cold. The chopping board, on the other hand, conducts heat badly, so even though there is quite a large temperature difference between the ice cube and the chopping board, relatively little heat is transferred. This means that the cube will melt slowly. It also means that heat is not transferred out of your finger quickly, and so the chopping board feels warm. On a metal surface, heat is conducted into the ice cube, melting it quickly, and cooling most of the surface. On a plastic surface, heat is not conducted well to the ice cube, so it takes much longer to melt, and only hte surface very close to the cube is cooled. There are many applications where the conductivity of materials is very important. If you want to move heat quickly like in the bottom of a frying pan you use a good conductor like copper or aluminium. But if you want to slow the transfer of heat such as through your jacket you use an insulator, like wool. I am writing a paper on this subject and was hoping that I could get a reference for this article. Why don't you just cite this page? I did my ice cube experiement last week. The cardboard took a long time to melt to the ice cube.